Olympic fever is rife in the UK in the build up to London 2012. The Olympic torch is making its way around the country, and the Cultural Olympiad is in full swing. A major talking point of late has been the official Olympic tower, which now sits in the Olympic Park. 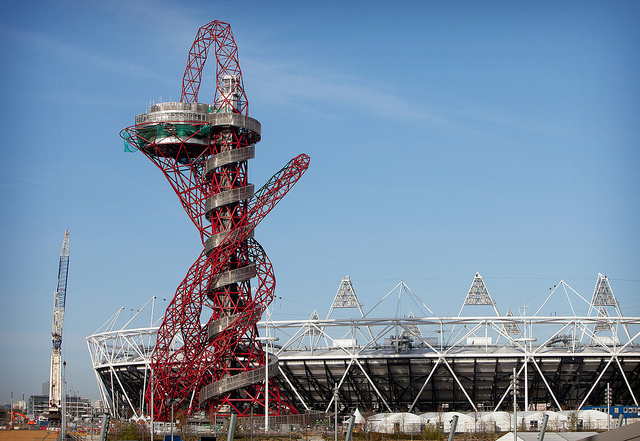 The tower, called Arcelor Mittal Orbit was designed by Anish Kapoor and architect Cecil Balmond. The red, twisted tower of steel stands at 115 meters tall, which, for a bit of perspective, is a whole 22 meters taller than the Statue of Liberty. As Britain's largest piece of public art, Arcelor Mittal Orbit will likely receive around 700 people per hour to its observation deck, which gives views of Olympic Park, the central Olympic stadium and the rest of London. The response to the sculpture has been extremely mixed. Much like Marmite, people either love it or hate it. Like much of Kapoor's work, the structure is unique in form and structure, and being brightly coloured, is no shrinking violet. The sculpture was named after the steel company who fronted much of the projects cost, with the tower coming in at $35.5 million, and as with all things Olympic will be compared to the offerings of Olympic hosts in the past. As the games creep closer, we look forward to seeing this, and other cultural offerings providing much warranted attention for the British arts scene.